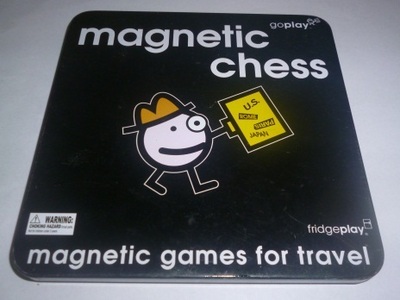 The Go Play range of magnetic games, produced by Fridgeplay Limited, have been designed specifically for travel. 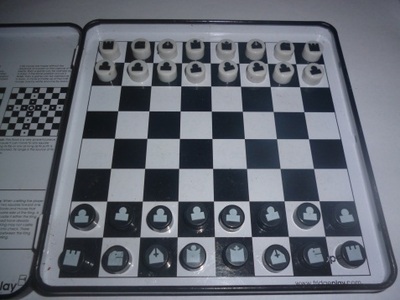 I have the magnetic chess set and I think the design is pretty effective - these are the perfect games to take away on holidays. Each Go Play game comes in a very slim metal case, which is only around 1cm thick, and 13.5cm by 13.5cm wide. The cases mean that the games are both durable and easily transported. However, people with larger fingers may find the small playing pieces inside frustrating to move. Because everything is magnetic, one of the best features of the Go Play range is that you can take a break in the middle of your game, even pack it up, and when you come back to it later your pieces will still be where you left them. Nothing moves during transport. And even though the games are very compact, you still get necessities like instructions. These have been printed on the inside of the lid (in very small writing admittedly). 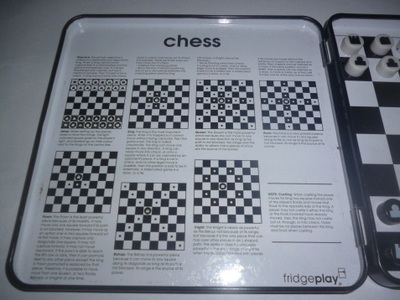 At first it seems like there isn't much space to explain an entire game (I'm used to entire booklets of information), but it is enough room to go into detail about the objective and possible movements of each individual piece that makes up chess. There are even diagrams. There is a large variety of Go Play games out there. As well as chess, the range includes backgammon, soccer, bingo, hangman, dominoes, draughts, and snakes and ladders. There are even magnetic Sudoku and soccer games. It sounds like there's something for every traveler.